Das Rheingold is a tricky opera to deliver successfully. The prologue to the Ring Cycle lasts about two and a half hours without an interval (making it one of the shortest Wagnerian operas) and the orchestra is just as prominent as its ensemble cast. It is the first time the audience hears Wagner’s mastery of the leitmotif, starting with that for the Rhine itself, and each important character, place or theme has its own musical signature that will return in the other operas in the cycle when mentioned or even just thought about. The opera requires a great orchestra under a skilful conductor, and an excellent cast of more than a dozen principals. Das Rheingold is divided into four scenes: the first deals with Alberich’s renunciation of love in order to steal the gold guarded by the Rhinemaidens; the second with the Gods bickering over how they are going to pay for their new home, Valhalla; the third shows Wotan outwitting Alberich and stealing the gold that has now been forged into a magic ring and tarnhelm; and the final scene shows the triumphant entry of the Gods into Valhalla. There are lots of subplots set up for the future operas during Das Rheingold, including Alberich cursing the ring so that everyone who comes into contact with it fares badly; Wotan breaking his word initiating the final downfall of the Gods, and deciding to father a race of warrior maidens (including Brünnhilde) in a vain attempt to prevent it. The Met’s Ring Cycle of 1961-2 came with a largely new cast, though the production itself dated back to 1948. The centrepiece of Das Rheingold was George London’s Wotan. London had been signing at the Met since 1951 and his dark, rich and vibrant baritone was ideally suited to such roles as Amonasro (available on PACO147), Don Giovanni, and Scarpia. He appeared at the first post-war Bayreuth Festival as Amfortas and later added the Dutchman (available on PACO136) and Wolfram to his repertoire. 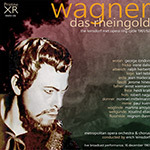 Wotan and the Wanderer were the final Wagnerian roles he assumed, but Leinsdorf and the Met management knew what they were getting as London had already recorded the role triumphantly for Decca in 1958. This was the first time he sang the role on stage. London gives us a nuanced and intelligent portrayal that makes us regret all the more the health problems that led to a premature retirement from the stage at 46 years old. Austrian baritone Ralph Herbert is a characterful Alberich and compares well with those who have assumed the role in more recent times. Mime is sung by Paul Kuen, one of the true masters of the role, in a rare appearance in New York. Kuen specialised in character tenor parts and was the Mime of choice at Bayreuth between 1951 and 1957. Karl Liebl, singing Loge, was a leading Wagnerian tenor in his own right, singing roles such as Lohengrin, Tristan and Parsifal at the Met. The cast is filled out with some top-notch performers. Irene Dalis, a notable Amneris, Kundry and Brangäne (available on PACO135) both in the US and Europe, is a powerful Fricka. Jerome Hines, whose Met career lasted for more than forty years in leading roles, features as Fasolt, Jean Madiera gives us perhaps one of the best portrayals of Erda ever heard at the Met, while Martina Arroyo (at the start of her glittering career) features as Woglinde. Although Erich Leinsdorf’s career at the Met lasted some forty-five years between 1938 and 1983 it included a lengthy gap between 1945 -1957. Leinsdorf started out in the Met’s German wing almost exclusively conducting Wagner. His repertoire expanded considerably after his return to the Met in 1957 and this production of the Ring was actually the first time he had conducted any Wagnerian opera (apart from Parsifal) since 1945. Leinsdorf gives us a taut, but never rushed, performance, and allows the Met’s orchestra to bring out the beauty of the score.